According to Statistics Finland's Education Statistics for the year 2014, 81 per cent of upper secondary general school students and 66 per cent of students attending vocational education aimed at young people completed a qualification in at most three-and a-half years. Forty-five per cent of students attending polytechnic education aimed at young people completed education in four-and-a-half years. A higher or lower university degree in university education was completed by 53 per cent of students in five-and-a-half years. 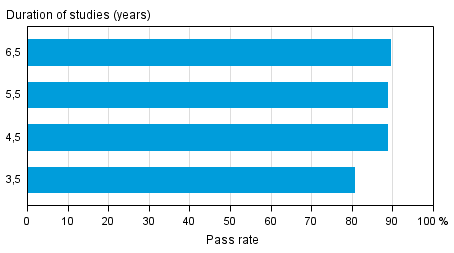 The share of passers of the polytechnic degree in those having started polytechnic education aimed at young people, that is, the pass rate of education, grows the longer time has passed from the start of education. Forty-five per cent of students completed their education in four-and-a-half years or faster. Education was completed in at most seven-and-a-half years by 67 per cent and in twelve-and-a-half years by 70 per cent of polytechnic students. Female students in polytechnic education completed their polytechnic degrees more often than men did. Thirty per cent of men and 58 per cent of women passed their polytechnic degree in at most four-and-a-half years, and the difference between the pass rates was 28 percentage points. Fifty-eight per cent of men and 75 per cent of women completed education in seven-and-a-half years, that is, the difference between the pass rates was 17 percentage points. Compared to the situation in 2013, polytechnic degrees were completed in 2014 more often in four-and-a-half years. The share of those completing their qualification in four-and-a-half years grew for men by 0.1 percentage points and for women by 0.6 percentage points. Fifty—three per cent of university students completed a higher or lower university degree in at most five-and-a-half years. The older the cohort of new students is examined, the higher the pass rate became: 69 per cent of students completed a higher or lower university degree in at most seven-and-a-half years and as many as 78 per cent of those having studied for 12.5 years had passed a higher or lower university degree. As in polytechnic education, there were large differences between sexes in completing university education. 41 per cent of male students and 59 per cent of female students had completed a higher or lower university degree in five-and-a-half years. 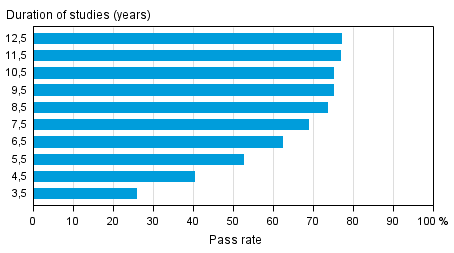 The difference between men's and women's pass rates was 20 percentage points. A higher or lower university degree had been completed in at most seven-and-a-half years by 59 per cent of male students and by 76 per cent of female students, and the difference between the pass rates was thus 17 percentage points. Sixty-eight per cent of male students had completed a higher or lower degree in 12.5 years. For women, the corresponding proportion was 84 per cent, while the difference between the pass rates of sexes was 16 per cent. Compared to the situation in 2013, university degrees were completed in 2014 more often in five-and-a-half years or in six-and-a-half years. The share of those completing their qualification in four-and-a-half years grew for men by 1.2 percentage points and for women by 2.0 percentage points. According to the data for 2014, upper secondary general education was completed typically in 3.5 to 4.5 years: Eighty-one per cent of new students in upper secondary general schools completed the upper secondary general school syllabus in at most three-and-a-half years. The share of those who completed the upper secondary general school syllabus did not increase much after four and a half years when the share was 89 per cent. 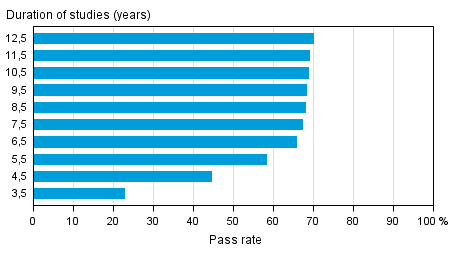 Men studying in upper secondary general school passed their qualifications slower than women studying there did. Eighty per cent of men completed their upper secondary general school qualification in three-and-a-half years, while for women, the corresponding figure was 81 per cent. Compared to the situation in 2013, upper secondary general qualificationswere completed in 2014 more often in three-and-a-half years or in four-and-a-half years. The share of those completing their qualification in three-and-a-half years grew for men by 1.2 percentage points and for women by 1.1 percentage points.. The duration of qualifications completed in vocational education for young people varies more than that of upper secondary general qualifications. Sixty-six per cent of vocational education students passed their vocational qualifications in three-and-a-half years or faster. Seventy-three per cent of students completed their education in at most four-and-a-half years. The pass rate for vocational education grew yearly slightly even for those having studied the longest time: 75 per cent of those having started studies five-and-a-half years earlier and 78 per cent of those having started nine-and-a-half year earlier had completed their qualifications by the end of 2014. The completion time for vocational education varied between men and women. Sixty-seven per cent of male students passed a vocational qualification in three-and-a-half years and 73 per cent in four-and-a-half years. Of female students, 66 per cent completed a vocational qualification in three-and-a-half years and 73 per cent in four-and-a-half years, which is slightly less than the corresponding figures for men. Seventy-five per cent of vocational education students had completed education in five-and-a-half years, and there were not differences between men's and women's pass rates. When the duration of studies was over six-and-a-half years, women completed the qualifications they had started more often than men did. For example, 79 per cent of women completed vocational education in at most seven-and-a-half years, while the corresponding figure for men was 78 per cent. The difference is slightly bigger for the cohort having started studies nine-and-a-half years ago: 80 per cent of women having started studying nine-and-a-half years earlier completed vocational education by the end of 2014, while the respective figure for men was 77 per cent. 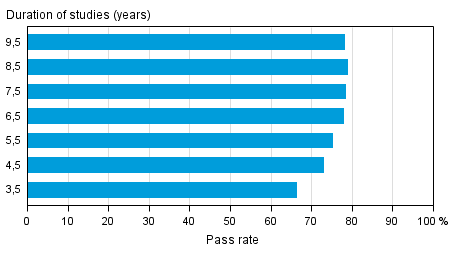 The database tables of these statistics contain information on the differences between the pass rates for different fields of sectors of education (see Tables in databases ). The database tables also include information on those students who did not attain their qualification in the target time. In these statistics, the number of completers of education relative to starters of education has increased particularly for tertiary level education. Other statistics also indicate that studying was more interesting than in the year before, as both discontinuation of education and employment of students decreased ( Discontinuation of education , Employment of students ). Official Statistics of Finland (OSF): Progress of studies [e-publication]. ISSN=1799-1021. 2014. Helsinki: Statistics Finland [referred: 24.4.2019].